Not to be confused with Van Halen. "Hôle" redirects here. For other uses, see Hole (disambiguation). 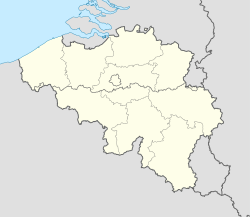 Halen, formerly Haelen (Limburgish: Hôle), is a municipality located in the Belgian province of Limburg, to the west of Hasselt. On January 1, 2012, Halen had a total population of 9,352. The total area is 36.29 km² which gives a population density of 258 inhabitants per km². The municipality consists of the following sub-municipalities: Halen proper, Loksbergen, and Zelem. During the First World War, on August 12, 1914, the Battle of Haelen took place here near the river crossing of the Gete. This Belgian Limburg location article is a stub. You can help Wikipedia by expanding it. This page was last edited on 9 December 2018, at 05:52 (UTC).